Lactating adult female mice treated with a single dose of 880 mg/kg i.p. 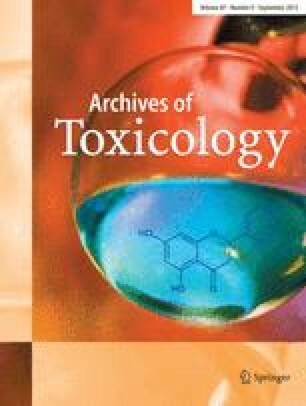 [14C]benzene, and their 2-day-old sucklings similarly treated or nursed by their treated dams were compared in terms of their ability to metabolize benzene to urinary products or reactive intermediates as assessed by covalently-bound benzene derivatives in whole blood or liver DNA. Six metabolite fractions were identified in the urine of sucklings by high performance liquid chromatographic (HPLC) analysis at 5 h following intraperitoneal (direct) treatment with benzene. Three of the metabolite fractions co-chromatographed with authentic phenol, phenyl glucuronide, and muconic acid, and contributed 11, 6.9 and 0.6%, respectively, to the total urinary benzene metabolites. Two of the fractions were unidentified. The sixth and most polar fraction consisted of multiple metabolites, 21% of which were conjugates, and accounted for 72% of the total urinary metabolites. A similar metabolite profile was observed in 24-h urine samples from treated dams with the exception that one of the unidentified fractions in the sucklings was absent and levels of the metabolites were quantitatively higher than those observed in sucklings 5 h following their treatment with benzene. Furthermore, 78% of the most polar fraction from the dams consisted of conjugates compared with 21% of that from the sucklings. The metabolite pattern in urine of sucklings nursed by treated dams was qualitatively similar to, but quantitatively different from the pattern in treated dams. Five hours following intraperitoneal treatment with benzene, covalent binding of the compound to DNA (expressed as pmol benzene equivalents/mg DNA) in sucklings was slightly higher in whole blood (1.15±0.07) than in liver (0.77±0.07), whereas in the dam, it was slightly lower in whole blood (0.88±0.48) than in liver (1.63±0.61). Twenty four hours following benzene exposure in sucklings of benzene-treated dams, DNA binding by the compound in whole blood (3.85±1.05) and liver (0.11±0.03) was higher and lower, respectively than the binding observed in benzene-injected sucklings 5 h following the injection. Our results show that excretable as well as reactive metabolites of benzene are formed substantially by the neonatal mouse, and that the extent of bioactivation of the compound is comparable in the adult and the suckling mouse. The results show also that sucklings of benzene-exposed mothers are exposed to substantial levels of the compound and are potentially susceptible to its toxic effects.